Students from Bohunt Wokingham teamed up with three other schools in the Bohunt Education Trust (BET) to set sail on a 7 day voyage. Sailing on a traditional 22m Wooden Ketch named ‘Faramir’, the voyage began at the Royal Harwich Yacht Club, Ipswich, navigating the River Stour, Brightling Sea and visiting Chatham Marina. This voyage was the first of its kind for BET, engaging students with first-hand experience of what it takes to sail and crew a yacht. Students were able to learn helming, sail handling, rope work, passage planning and the safety that is required onboard. All students took an active role as crew ensuring that duties above and below deck were completed. Tasks included keeping a look out, helming, hauling on ropes to raise the sails, in addition to galley duties to keep the crew fed and watered. They quickly learnt that teamwork and communication was vital in getting the tasks done. 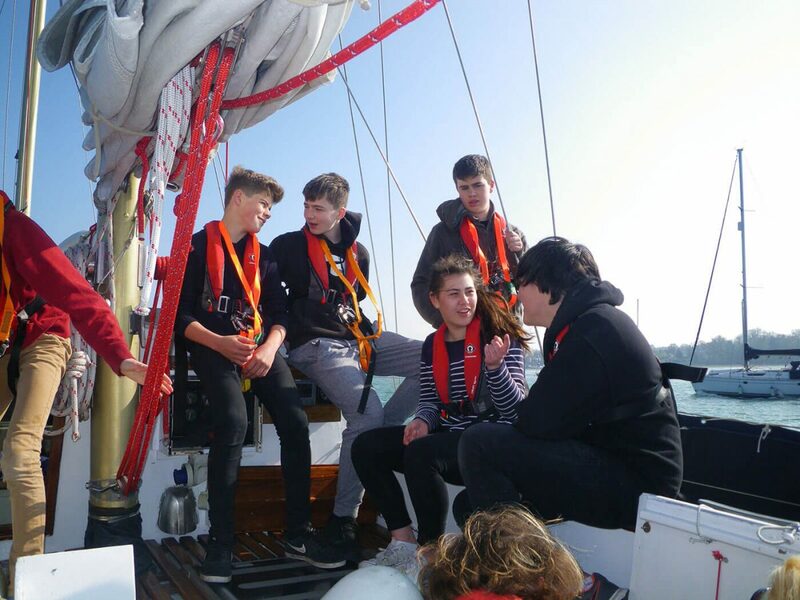 The students, joined by three other schools across the Trust – Bohunt Worthing, Bohunt School Liphook and The Petersfield School, worked in 3 teams known as ‘Watches’ to sail the yacht as part of their extensive Outdoor Education Programme. Students aged between 11-15 years took on roles such as Watch Leaders and Anchor Watch. Passage planning was one of the more difficult tasks to complete as a team, as it required a thorough understanding of the tidal patterns in the region, topography, weather conditions and the wind direction to enable a viable navigational route. The students quickly grasped that navigational charts were like a mathematical problem and, using the nautical almanac, yacht’s navigation equipment and weather information system the students were able to plot a suitable passage plan. All students had the opportunity to work towards the Royal Yachting Association Start Yachting qualification, with 5 students exceeding expectations and receiving their Royal Yachting Association Competent Crew certificates. This was a fantastic achievement for our young people and has empowered them to further develop their skills they have learnt into everyday life. This experience is part of BET’s vision for Outdoor Education to help students develop responsibility, resilience and independence. Students have a structured programme of adventurous activities, encouraging individuals to explore, dream and discover, which begins in Year 7 and goes right through to Year 11. BET prides itself on providing a wealth of activities including Duke of Edinburgh, Bushcraft and runs Big Expeditions to locations such as Greenland and Kyrgyrstan. We will be expanding our Outdoor Programme with exciting additions through our new Sixth Form, opening on the Bohunt School, Liphook site in September 2017. “We have a culture of game-changers at Bohunt: we constantly strive to push the boundaries of achievement in the widest sense of the word and work hard to offer students the chance to expand their experiences to include organisations outside for classroom. Sailing aboard Faramir this Easter has reinforced the fact that outdoor education activities provide a challenge, boost self-esteem, improves confidence and build relationships. Enabling our students to be fully equipped with these life skills and personal qualities in everyday life. The voyage was run by the Cirdan Sailing Trust, sponsored by the Voyage of Discovery Fund. Talking Heads – Why Work at BET?